In the fourth pAsuram, when parAnguSa nAyaki‘s friend asks her “What are you planning to do to this cruel emperumAn who is not coming even after you are suffering in separation?”, parAnguSa nAyaki censures her friend saying “How can you say that he who nurtured great attachment in me towards him, is cruel?”. Fourth pAsuram. parAnguSa nAyaki said “en seyyum Uravar kavvai“; her friend says – even if the people are hurling accusations, at least if he shows up, we can tolerate their accusations; this being the case, he is a cruel person; she is thinking to stop parAnguSa nAyaki somehow and says “he is merciless”; parAnguSa nAyaki says “Alas! How can you say this? What bad did he do to us?”; her friend says “See, he has not showed up even in this dire situation when the people are blaming you”; parAnguSa nAyaki says “though he has not come now, he has made me to not focus on anyone else even when he is not present in front of me! Is this bad? [No, it is good]”. kAramar mEni nam kaNNan thOzhi kadiyanE? thOzhi – Oh friend (who praised his qualities before and engaged me in him)! kadiyanE – (now, to be blamed) has he become cruel? 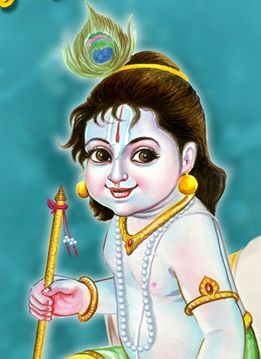 Our obedient krishNa, who is having cloud like divine form, used the accusations of people as manure and mother’s constant advise as water, sowed the paddy seeds of desire and let it sprout in the fertile field of my big heart and made (abundant ocean like) devotion to occur in there amidst huge noisy accusations of people. Oh friend! has such emperumAn become cruel? Uravar … – Did you do all of these [emperumAn‘s actions which are described in “Uravar … viLaiviththa“]? As soon as inimical aspects were removed, people started blaming me. [Example] SrI rAmAyaNam AraNya kANdam “vibhIshaNasthu dharmAthmA” (sUrpaNakA says – vibhIshaNa is a noble/righteous soul) – they said that even before he left lankA [i.e. he only started thinking about giving up the relatives]; he is not having the nature of those belonging to that clan and has some differences; that distinction is highlighted by the word “dharmAthmA“. [Is saying dharmAthmA, an accusation?] As generally “maRakkudi aRam seyyak kedum” (in an evil society, being good is condemned); same SlOkam “nathu rAkshasa chEstitha:” (He does carry out demoniac activities) – he only has demoniac birth [beyond that, there is no such demoniac qualities/activities]. emperumAn used the accusations of people as manure. Had they not blamed her, she would have withdrawn from him; even when she was trying to forget him, the people kept reminding her about him. annai … – The mother too, previously was thinking “she is a [little] daughter”, and only after hearing the accusations of the people, she came to know about it. Mother’s words – advise for her well-being. Using that as the water. Manure is done once [or twice], but the crop needs to be watered daily; people may hurl accusations once and stop, but the mother would be present inside the home always and be giving advise. Ira nel … – Sowing the seeds of attachment. Her attachment is such that, even whatever she knows, it is about emperumAn only; she does not know anything other than emperumAn right from her childhood as said in thiruviruththam 60 “mulaiyO muzhu muRRum pOndhila .. perumAn malaiyO ivaL thiruvEnkatam enRu kaRkinRa vAsagam ivaL paramE” (Right from the age when her bosoms were not well developed [i.e., in her childhood itself], she was only talking about thiruvEnkatam). She did not have to develop detachment towards other aspects after initially having attachment towards them. emperumAn is the mUlasukrutham (original virtue) which bestowed her the knowledge about him. muLaiththa – Even after applying manure and watering the crop, he needs to create, when it is time to sprout and acquire the strength to come out [i.e., though the raw materials may exist, only by his sanction, subsequent transformation happens]; [a proof for the aforementioned statement] SrIvishNu purANam 1.9.125 “SarIrArOgyam aiSvaryam …” (indhra to SrI mahAlakshmi – body, health, wealth etc occur are difficult to attain without your merciful glance) – the tools for enjoyment is first explained followed by separately highlighting the enjoyment that is derived and it is explained that his mercy is required for both. emperumAn‘s mercy is required to ensure that the result of one’s virtue is not enjoyed by another, just as a weak entity is overcome by a stronger entity. nenjap perum sey uL – By impacting her heart with repeated samSlEsham (togetherness) and viSlEsham (separation), he expanded her heart to be like nithya vibhUthi (the vast spiritual realm, SrIvaikuNtam). In the field of heart. Adding the accusations of people as manure, having the mother’s constant advise as water, sowing the paddy seeds as desire, all of which were nurtured in the vast field of heart. pEr amar … – It has grown in to huge love which cannot be shaken by the accusations of the people and the advise of the mother. Here “kadal puraiya” (abundant as ocean) is explained further in thiruvAimozhi 7.3.6 “kadalin migap peridhAl” (greater than ocean) and in thiruvAimozhi 10.10.10 “adhanil periya en avA” (my love which is greater than emperumAn) – it grew to consume ISvara himself; thus, it was AzhwAr‘s loving devotion which was nurtured by emperumAn starting from thiruviruththam 1 “poynninRa gyAnam” and ending with thiruvAimozhi 10.10.10. parama bhakthi [the third and final state in para bhakthi, para gyAnam and parama bhakthi] occurs just at the exact previous moment before the commencement of kainkaryam [in paramapadham (spiritual realm)]; while entering paramapadham, he must have parama bhakthi, and while entering there, he cannot be any different from those who are already present there [with parama bhakthi]. It is the same devotion which was bestowed by him first in thiruvAimozhi 1.1.1 “mayarvaRa madhi nalam” (unblemished knowledge and devotion), which is nurtured to this state. The huge love. The love which matches the dharmi (entity – AthmA). Another explanation – the love which can cause very noisy situation. It has caused people of the town to accuse and fight with her. amar – battle. periya thirumadal “kAmavEL mannum silaivAy malarvALi kOththeygiRa kAdhal” (the cupid is aiming with his flower arrow/bow). What is the difference between Iram (attachment) and kAdhal (love)? They are all different stages of love as said in SrI bhagavath gIthA 2.62 “sangAth sanjAyathE kAma:” (attachment leads to love); when looking at one stage, the other stage identifies the object as a different one. kAr amar mEni – Though one may apply manure and also water the crop, unless there is rain water, the crop will not become cool; emperumAn poured down with his form. Invigorating form like a pregnant cloud. nam kaNNan – She is not of the nature who just gets captivated by the pleasing form, but will look for mercy inside the heart. It is well known that “krishNa is a servitor for women”. krishNa who gave his form and himself to us. thOzhi – Who are you talking like? What will he do after you, who first connected me with him, are unable to withdraw me from him as I have developed such deep attachment with him? Do you do both! You are the one who united him with me saying “he is merciful” and you are the one who is trying to take me away from him saying “he is merciless”! Has he who was identified by you as merciful, become merciless now? This entry was posted in thiruvAimozhi, thiruvAimozhi 5th centum on June 17, 2017 by Sarathy Thothathri.